We have been helping people with wet carpets for over 30 years. We offer carpet drying, mould decontamination, rain water leak finding and fixing. We can even collect your Car. Our customers come from London, the South East and even further. If you have water dripping on your shoulder from a leaky sunroof every time it rains, then it's pretty obvious where your leak is. But as often as not, you may find your car begins to smell of stale water and your carpets are wet/damp, but there's no obvious cause of the leak. Electrical problems can also be an indication that water is leaking into the car. We have a range of methods for detecting leaks, and we can also deal with mould, odours and dry your car. Most cars will have just one water leak, although in some cases there may be several water leaks in one area, like around a windscreen for example. A small minority of cars possibly may have several water leaks and this is often the case with cars that have experienced body damage, a recent respray or older cars where rubbers and seals may have perished uniformly. Sometimes it's not really possible to know that there are additional leaks until the first leaks are identified and fixed. Drying the carpet underlay. Although the carpets often just seemed damp, it isn't unusual for us to extract 6-10 litres of dirty rainwater from floor pans and footwell. 75% of leaks are detected in the first hour. 95% are detected within 2 hours. After the inital hour, the price of identifying and fixing leaks is charged in 15 min blocks as they may only take a few minutes. *For specialist machines and products such as solvents. Normal materials/sundries are in included in the hourly rate, eg detergents, masks & gloves. Most cars have guttering and drainage holes which channel rainwater away from the car. A build up of dirt and debris can cause water to pool and backwash into places it isn't supposed to go. Often just cleaning in those hard-to-reach areas is enough to stop the problem. The same can be said of a build-up of dirt on rubber seals. Often it is the case that a sunroof or windscreen leaks because seals have perished or because it has been incorrectly fitted or re-fitted. If this is the case then CCS Windscreens can repair it, they are just a short drive away. There are many other reasons why your car may leak, often we can fix them here, but if not there are plenty of companies right here in Chelmsford that can help. * With Vauxhall/Opel Corsa, nine times out of ten the problem is the seal on plates behind a servo and the driver's pedals. These will require replacement at a garage. Once rainwater gets into your car, there is a good chance that it will result in mould, mildew and bad odours. Often it will be a warm swampy odour that tips you off to the fact that you have a leak. We shampoo the flooded area and then use enzymes to kill the bacteria that causes bad smells. Odours can be very difficult to deal with so we have a policy that if the service we recommend doesn't eliminate the odour, we allow you to upgrade to the next service and you only pay the difference. When you have damp, soggy or wet carpets it's easy to assume it's only about a cup full water in your foot well, but with the carpet underlay sodden, it's more likely it's over a gallon and could easily be two or three! This could take months to dry out naturally over the winter, and unless the water is removed it's highly likely that other problems will occur. To remove the water we would either remove the carpets or lift them (see photo slideshow above) we then use an extractor to remove the water, we then use de-humidifiers, air-movers and pipe in warm air to get the car dry. The most immediate problem with a footwell full of water is the threat it poses to your car's electrical systems. Modern cars are packed full of computers, modules, sensors and wiring, many of these are hidden under the seats and carpets. Most of these systems are reasonably well water-proofed, or are at least splash proof, so we don't want to overstate the danger, it's not a foregone conclusion that it will ruin all your electrics, but that said, they aren't designed to withstand prolonged damp let alone submersion and they can be very costly to put right. Air bag control units are probably the most likely to be effected which raises safety issues. 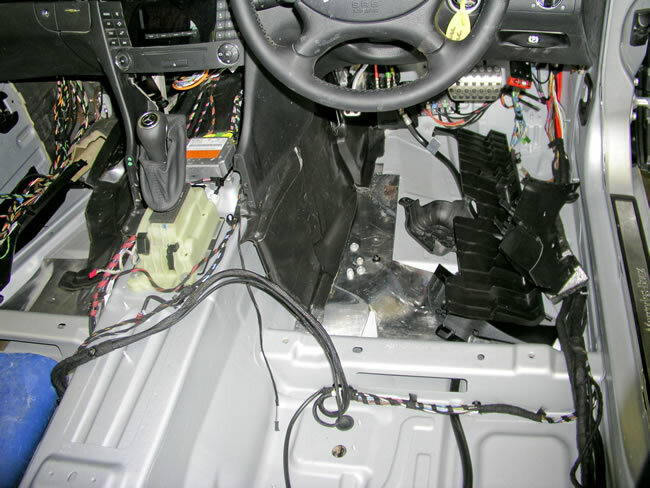 Electrical modules and wiring under the carpets of an average car. In some prestige and executive models the quantity of wiring is staggering. The second problem is that the contamination from dirty rain water is likely to lead to damp problems throughout the whole interior of your car. If you are waiting for the car to dry out naturally, you're in for a long wait, as unfortunately the water really has nowhere to go. You will soon notice condensation on the windows causing visibility problems, in winter this can lead to frost forming on the inside as well as the outside of the windows. 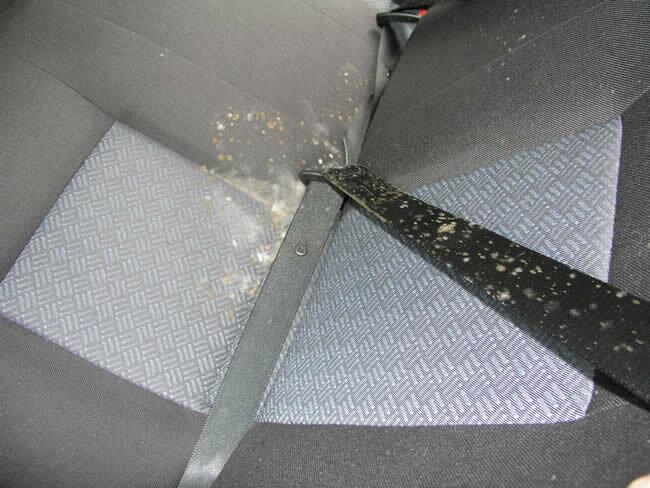 The general dampness of the car can soon lead to the growth of fungus, mould and mildew and an overall damp, musty smell. Mould growing on damp seats. VIDEO: In this video we demonstrate how we decontaminate, dry and repair a Water Leak on a new Mini purchased from a main dealer.